Thanks guys. I'm always impressed by how helpful you lot seem to be. Both machines allow you to manually discriminate, which means both can be set up the same mate. Mind you the coil on the Euro ace is a better coil, Because the Euro ace also gets called an Ace350. Its the model up but only difference is the larger coil and the stickers. I bought the Ace 250 "sports pack" which came with the additional larger coil, which i am using. 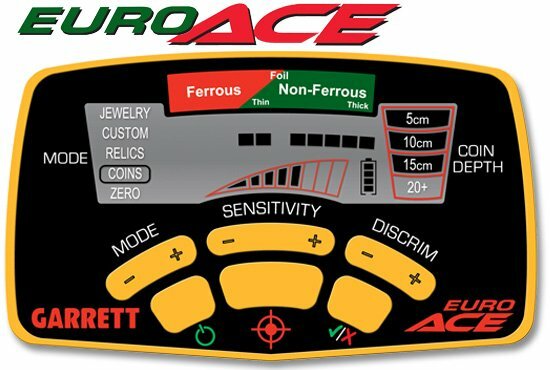 Having tested both the Ace 150 and the Ace 250 in the past you will from time to time get baffling signals and targets? If you are going over anything made of iron or steel that has a hole in it then you may get a conflicting yes and no responses in other words the cursor will bang off either side left and right, it still makes perfect sense though to check the target out and dig it as you can also on occasion get a similar result from a tin can on or something good but big! If you get an erratic cursor movement signal but also a Bell Tone the chances are it could be lead! And if you get a Bell Tone sounding signal but the cursor will sit around the 5 Cent mark it could be Coke, bearing in mind that Coke will a good sounding tone anyway. I have just got a hold of an Ace 250 again myself which I am putting through various tests for some project work so even I am just familiarising myself with this great detector again ! Gold Half Sovereigns by the way will give you the mid tone and the cursor will sit bang on under ring pull as the gold marker is directly above that, and from past experiences as well a hammered penny will probably come in on the 5 Cent mark but may give off a very poor iffy sounding tone? I have also found in the past that the bigger search coil should give you deeper targets but on some soil conditions it doesn't always do a good job, but one search coil I do like is the wee Sniper for it has its uses and believe me it has pulled up some coins. i also have a ace 250 i also found that hammered coins also show up under ring pull(steady sitting) so all be aware not to discriminate that out i also found it best to run it in relic mode too. You will learn the rest of its little tweaks and twerks with experience. So even if the signal bounces around quite a lot i should dig it anyway (unless it also triggers in the iron zone in which case i ignore it)? I always thought i was looking for a nice steady signal? My current permission gives me ' bouncy' signals every few feet! I'm running relic mode with 80% sensitivity. I find I'm out for hours with not much to show ha. I would walk round the target, if it gives a solid bell tone or mid tone defo dig. If its bouncing all over I would dig if there is more good tones than bad, this will be hit or miss but you will soon learn what to dig and what to leave. If it solid iron low grunt don't dig. I had a really bouncy all over the place signal with lots of iron tones that I would normally leave, but due to lack of signals I decided to dig. Turned out was a complete copper alloy Georgian shoe buckle in really good condition. Back in the late 80,s i used many of the Garrett range of detectors including other manufacturers too and as many of you know the Garretts were and still are designed to let the user know what the target is in a very vague manner with pictures of various coins Quarter, Pull tab etc especially in the lower range beginner detectors. When the target signals and audio start dancing all over the place it is basicaly down to a handfull of reasons like the ones below. 1. The processor due to various reasons cannot make its mind up what to tell you. so it waffles on with eratic screen displays and yes sometimes falsing. 2. Falsing due to (too) high sensitivity being used by the user where by the ground is being detected rather than the targets. Electro magnetic Disturbances from your Mobile Phone, and or Powerlines in the fields around you, even electric fences.Please remember to consider the above. 3. Some targets based on their desnity and position in the ground will also cause your detectors processor to get confused and give a false reading and or a differént target area on your screen if indeed you are looking at the target icons such as Quarter Pull tab etc etc. If they turn out to be a good high conductive target then you will know that it is just the way the taget has been sitting in the ground or that it was next to some small nails etc. If it does turn out to be iron or Nails, then you need to increase your discrimination level, b ut do this very carefully. And finaly you can reduce your senstivity as it is allways possible that you are detecting medium to high mineralisation in the soil. The higher priced detector,s are better kitted out in many instances for problems like the above with automatic ground ballance etc etc. What ever you do. Do not Descrim out Ring pulls or anything close to their position on your detecting screen as ring pulls live in Silver coin and hammy country.